11 Jul Do Solar Panels Increase my Home Value? Installing a solar energy system on your roof can significantly increase your home’s value. 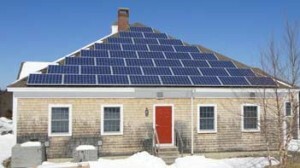 Solar houses are cheaper to operate because the electric bills are dramatically lower. In fact, under net metering, many Sundog Solar customers pay only the delivery fee that is required by all electric utility customers and do not pay for power consumption. A study by the Lawrence Berkeley National Lab titled “Selling into the sun: Price premium analysis of a multi-state dataset of solar homes“ found that solar homes sell for far more than homes without solar energy systems. Home buyers are willing to pay a premium for homes with solar PV systems. On average, solar houses sell for $3 more per watt of installed solar energy capacity. A home with a 5,000 w (5 kW) system would, therefore, sell for roughly $15,000 more than a comparable home without solar energy. It is important to note that this home sale price premium does not apply to leased solar systems. At Sundog Solar, we recommend homeowners to purchase outright or finance solar systems (at a low rate) to maximize the cost savings of solar energy. Want to learn more about solar energy for your home? Contact Sundog Solar today at 207-548-1100.